Sacha Kljestan (16) making a big defensive play early. Photo by Jason Schott. 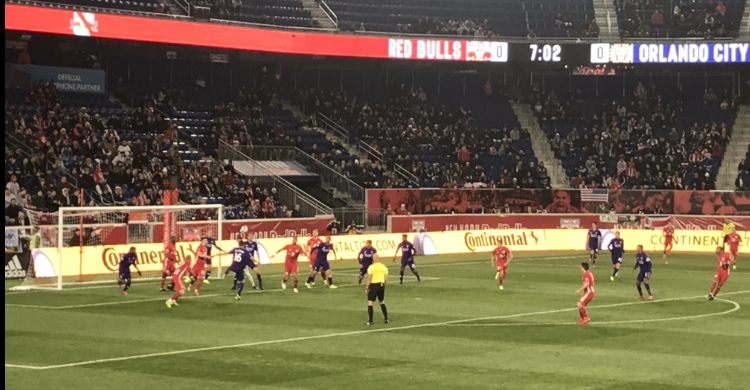 The Red Bulls lost a tough one on Saturday night, 1-0, to Orlando City SC, on Saturday night at Red Bull Arena. Sacha Kljestan, who used to star for the Red Bulls, got the lone goal of the night for Orlando City in the 73rd minute. Dom Dwyer started the attack into the Red Bulls' zone down the left side, then he got it to Joao Moutinho, who sent it across the box to Kljestan coming down the right side, and he buried it. The Red Bulls had plenty of chances late, including one from Bradley Wright-Phillips in extra time, but they couldn't get the equalizer. BWP also had a big chance in the 55th minute when he took a shot from the top right corner of the box that just missed sneaking inside the left post. The frustration boiled over late, as Red Bulls goalkeeper and captain Luis Robles took a yellow card arguing with the referees after the final whistle. Orlando City improved to 1-1-2, with 5 points, while the Red Bulls dropped to 1-1-1, 4 ppoints. This snapped the Red Bulls' MLS unbeaten streak of eight matches (6-0-2), dating back to last season. They dropped their first league home match since July 28, 2018 against Columbus Crew SC. The unbeaten home streak spanned seven matches, dating back to last season. That was partly due to the fact the Red Bulls were without a lot of key players due to international commitments: Kemar Lawrence (Jamaica), Michael Amir Murillo (Panama), Kaku (Paraguary), and Aaron Long (USA). 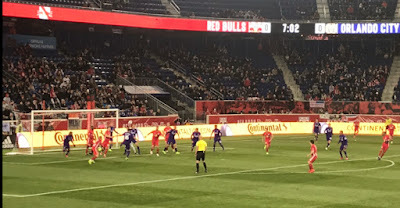 The Red Bulls had a tough night on the injury front, as Connor Lade had to leave in the 26th minute after he was clipped by Santiago Patino as he went in on a challenge along the sideline in front of their bench. Lade was replaced by Omir Fernandez, who had to leave himself due to injury in the 80th minute. Alex Muyl also got clipped a few times, including a shot across his face going for a ball in the air, but he played the full 90 minutes. "We would have done ourselves a bigger favor if we were, if we knew that second balls would be a big thing on the night. Sometimes when we play directs, we knew that they would play directs, looking to get behind, the big diagonals that they were hitting. This is all about second balls and if you're on the winning end of those, you get more opportunities to maybe catch them. So yeah, there was a number of things, but yeah, we feel like we left points out there for sure and then on the night, we're not too pleased at that performance." Armas said of the physicality of the match, which included five yellow cards, "The one after the game is to Luis, and it's for Orlando wasting time, which they did all night. So you can see that it was a deliberate attempt to slow the game down and they were taking time, which you know, as a league, I don't think we want this to look that way, and it's being addressed. "It's hard to manage that, though, without dishing out yellow cards. That's frustrating that we're losing, we lost. That's frustration, I forget which player it is, he picked the ball up at the end and threw the ball away and they are saying that's an easy yellow card, and they are right, according to what the league has said they are going to crack down on. We talked internally with the league; we want to get this stuff right. "But listen, there's frustration from bigger reasons than that. I want to make a clear statement here that it wasn't the referees. It wasn't that they slowed the game. The main thing is we didn't play that great, and that frustrated our guys. It's just a little bit frustrating that we couldn't get the real rhythm, and of course, the little bit of the stoppages and the fouls, which, I mean, our guy got kicked in the face, our guy got fouled -- I don't remember us fouling him too recklessly."